The same week Google introduced its new Google+ social networking service, the Facebook active user population reached 750 million. Starting from zero, it’s clear Google has its work cut out for it. On the other hand, the former king of social media, MySpace, was sold that same week for a paltry $35 million after fetching $580 million just six years ago. Clearly, the tectonic plates of the Internet are still subject to massive shifts. The question is, does Google+ have what it takes to make Facebook shake? Let’s look at how the new service stacks up. 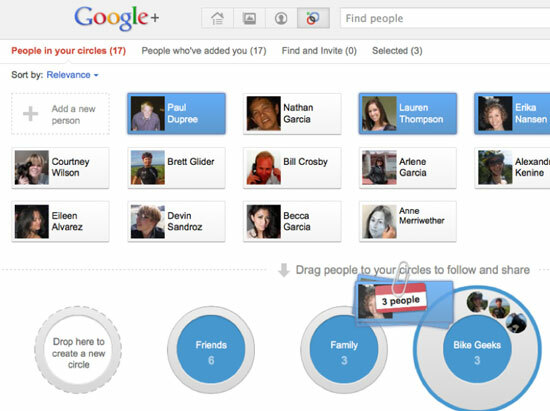 The heart of the Google+ experience is Circles, the system used to manage your connections with other people. In Facebook, all your friends see what you post unless you go out of your way to impose person-by-person restrictions. You can create separate Groups if you like for more private interactions, but these are separate from the main ongoing conversation. Google provides more active management of your social connections. You start out with four default Circle categories: Friends, Family, Acquaintances and Following (i.e., people whose feeds you’re reading, but not interacting with). As you add contacts to Google+, you drag and drop them into appropriate Circles. You can make these circles as specific as you like – Monday Play Group, for example, or High School Friends. An individual can be added to multiple Circles if you like. And nobody can see your Circle names, so if you add your office colleagues to the Jerks from Work group, nobody will be the wiser. Now, when you want to post something on Google+, you indicate who should see it – just one Circle, multiple Circles –, or make it public for anyone to see. This way, if you want to share something silly or borderline tasteful, your friends can see it and your family, or the guy in the next cubicle, will be none the wiser. Similarly, if you want to kick around work-related information and ideas, your family and friends won’t find that irrelevant info on their screens. 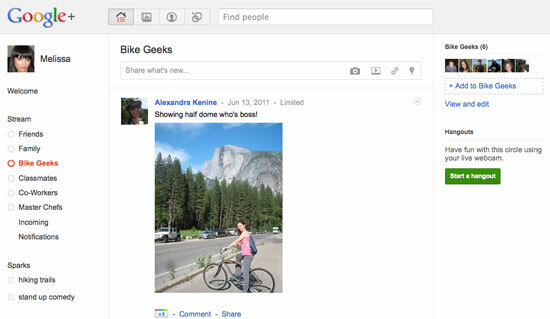 Facebook users will have to readjust their concept of “friends” when using Google+. With Facebook, you send a friend request, and the other person has to respond positively for the relationship to take hold. With Google+, if you discover somebody on the service you find interesting, you just drag them into a Circle and they’re yours – no confirmation required, though you do get a notification that you’ve been added so you can add them as well if you choose. This sounds more intrusive than it really is, because you’ll only see posts that person has flagged as “public” if he or she hasn’t added you to a Google+ circle too. Still, when it comes to adding people to circles, the relationship is more like following someone on Twitter than friending them on Facebook. In most ways, posting to Google+ is similar to Facebook – even the layout of your Google+ Stream looks a lot like a Facebook News Feed. You can post comments, links, photos and videos. Commenting on posts will also be a familiar experience. One nice difference with Google+, though, is that you can filter your Stream, choosing to view only posts from those in one Circle at a time. This works brilliantly. For example, I’ve added several tech gurus to my Stream, people whose opinion I value but whose posting output swamps everybody else. Now I can click on my Friends circle to find the goofball oddities we like to share, then switch over to my Guru circle for a firehose in the face of well-informed blather. Another welcome change is the way tagging people in photos is handled. On Facebook, anybody can tag anyone in a photo. That image is then highlighted for all your online friends to see, even if you’d rather they didn’t. What’s worse, unauthorized photo tagging has been used as a way to spread spam and malware on Facebook. On Google+, you have more control. By default, people in your Circles can tag you in photos, while you have to approve a tag from outside people. However, it’s easy to change a setting and require approval for any tagged photo. I’d consider that a smart move. The headline feature when it comes to Google+ messaging is the Hangout, which enables video chat with up to 10 people simultaneously. 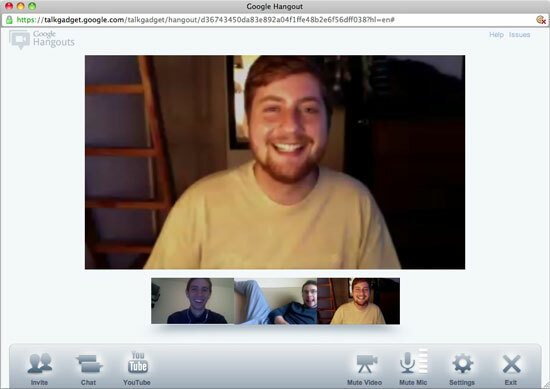 Yes, there are other services that offer group video chat, but the Google+ version is incredibly simple to use, free, and works nicely, with solid audio and video quality. In the righthand column of the Google+ page there’s a green button that says “Start a Hangout.” You click on it, install a small app if it’s your first time hosting a session, check your hair in the video preview image and that’s it. As with other Google+ messages, the notification that you’re ready to hang out goes only to the Circles you specify. People click the notification to join the conversation. The software automatically switches to feature the person who’s speaking in the large top image, with smaller live images below of everyone else who’s participating. This is a very well-crafted feature, useful for casual schmoozing but also for quick business conversations with multiple participants. Another interesting feature of the Hangout” the ability to watch YouTube videos online together, commenting on the action. As expected, Facebook announced a partnership the other day with Skype to enable online one-to-one video calling without downloading, installing and launching the separate Skype software. They also introduced group chat, but that’s strictly text-based. Both worthwhile features, but neither has the sizzle and satisfaction of Google+ Hangouts. You can also conduct standard text chats if you prefer. What’s oddly missing, though, is the option to send a private message to a Google+ connection, as you can on Facebook. Yes, you can always send an email, and if there’s an address attached to your intended recipient’s contact info an Email option appears beneath his or her profile picture. Still, having a separate messaging channel within Google+ seems like a worthwhile, missing feature. 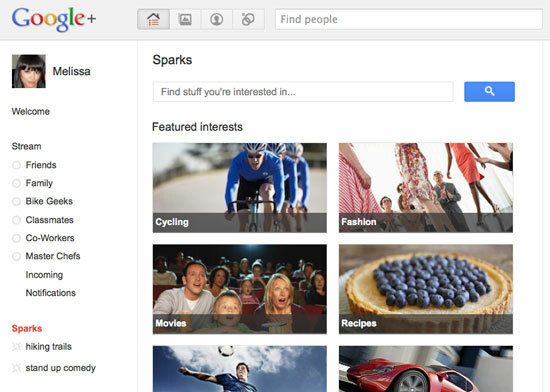 The final two features worth calling out here are Sparks and the Google+ Android app. Sparks is meant to deliver web-based information that will “spark” a conversation. There are ten preset categories, including Recipes, Movies and Android, but it’s perfectly simple to add your own category – the name of your favorite TV show, for example, or a nuclear physicist you fancy – and get an instant list of article results. Any term you like can be “pinned” under Sparks for future one-click access. Yes, it’s basically just performing a Google search, but the ability to store the search term, and have it built into the Google+ interface are nice touches. For access on the go, the Google+ Android app is a treat. It includes your Stream, Circles, Huddle (group chat for one to fifty people) and Photos. You can share cell phone photos with your Circles from the app, as you’d expect, but you can also turn on Instant Upload to automatically send any pictures you take to a private folder in your Google+ account. No more worry about downloading photos from phone to computer – Google+ handles it for you. Those are the highlight features of Google+ as it now stands – Google has made clear that this is a work in progress, and we can expect new bells and whistles to be added before long. Part of the pleasure of the service today, though, is precisely what isn’t there – the dreaded Facebook clutter. No games. No malware, spam and scams. No companies hawking their wares. No intrusive questions in the user profile (though I do kinda miss “birthdays” as a field). The giant missing piece of the puzzle for Google+, of course, is all your friends. What makes Facebook so important isn’t the wonder of the software, but the fact that all your friends are there. For the foreseeable future, I expect many curious folk will keep both a Facebook and a Google+ account, taking advantage of the distinguishing features of the new service but not sacrificing the sheer mass of contacts Facebook provides. Over time, though, this may well change. Google can certainly afford to keep Google+ up and running until the next ice age, and initial feedback has been very positive. Have you checked your Myspace account lately? The trick right now, of course, is getting into Google+ at all. As I write this, the service is in a “field trial” which consists primarily of invited journalists and Google employees. Every so often, it seems the door opens briefly and some lucky people squeeze through before it shuts again. When will this change? Your guess is as good as mine. In the meantime, if you know someone who’s already a Google+ member, he or she can add you to a Circle even if you’re not part of the service yet – you’ll receive updates via email, along with a link to join which may or may not work at any given moment, depending on demand. Otherwise, just head over to plus.google.com and hit the Keep Me Posted button. Thanks for turning me even more off Google+. I happen to like Facebook tagging and how it automatically tags you without you having to approve it. It saves time. I utilize my privacy settings on FB, so they are extremely private and most of the people on my list can’t even see my tagged photos unless they have access to them. What a fail. Google+ shows me how ignorant a lot of Google+ users are when it comes to Facebook. Funny that a lot of them brag about being geeks. Haha, what a joke. I know the Internet is not private, though, and I think that Google+ gives people an illusion of security that they don’t really have. I hope a Google+ fail site opens up to show this to them. Remember, Google employees can read your e-mail. I’m not so quick to trust their social networking site, and neither should you be. A former Google employee was actually caught stalking teenagers e-mails without their permission…. Who knows how many of the rest of them do that? Thanks for the insight and information. Google is the company to take on Facebook and provide some healthy competition. I can’t imagine that Facebook would let go of its dominant position though, so if Google begins to score big with users, Facebook will evolve its service as needed to incorporate the winning approaches. Either way, it’s a win for consumers. I can’t wait ... I want an invite NOW! I hate that I cannot chose which friends see certain things I post and I hate all those darn adds and games, they clog up my screen!